For the past two decades, the magical world of Harry Potter has captivated the imagination of both young and old worldwide. ‘Potterheads’ as they are fondly called, continue to be enraptured by the enchanted world of witches, wizards and fabled beasts. First published by Bloomsbury in 1997, Harry Potter celebrated its 20th anniversary on 26th June last year. Since JK Rowling first published Harry Potter and the Philosopher’s Stone, over 500 million books about the character’s mystical life have been sold worldwide in 80 different languages*. All seven books in the series have been turned into films and according to a report compiled in February of this year (2018) by Statista, the first film produced, Harry Potter and the Philosopher’s Stone stands as the UK’s sixth most successful film of all time, with a box office revenue of £89.1 million*. The final film of eight, Harry Potter and the Deathly Hallows Part 2, gained a staggering worldwide box office revenue of $1,341.5 million*. Who could have imagined that a young wizard from Godric’s Hollow would conjure up such an awesome amount of delight for generations to enjoy? To ensure a magical Christmas this year, why not indulge the budding witch or wizard in your life with a spellbinding gift? High Street retailer Ryman Stationery have a huge selection of Harry Potter games, toys and stationery, perfect for Potterheads. So, whether you’re a dastardly Draco Malfoy, heroic Hermione Granger or even a Moaning Myrtle, you’ll be sure to find the right present to suit you. Expecto patronum! Send them off to school with this beautiful Harry Potter Hogwarts Backpack (£24.99). With plenty of space for storing books, quills and parchment, it’s the perfect accompaniment for Charms, Transfiguration or Defence Against the Dark Arts lessons. But don’t forget your wand! The Moleskine Harry Potter Diary Week to View Large (£21.99) will keep appointments, dates and ‘to-dos’ compact and organised throughout the year whether at school, university or the office. Just be sure to solemnly swear that you are up to no good! Accio, Wand! With this Harry Potter Albus Dumbledore Wand, Pen and Bookmark Set (£8.99) you can recreate the legend’s enchantments with a replica of his famous elder wand. Also featuring a pen to jot down spells and a bookmark so you never lose your place within your History of Magic textbook. Ever wondered which house you would be selected for by the Sorting Hat or wanted to indulge in a Christmas Banquet? 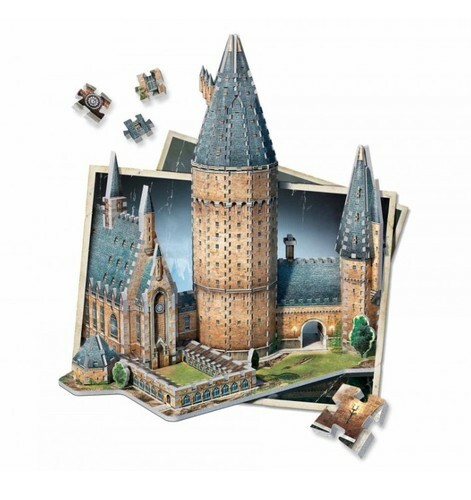 Bring the Great Hall to life at home with the Wrebbit 3D Hogwarts Great Hall Jigsaw (£39.99). So, whether you belong in Gryffindor, Slytherin, Ravenclaw or Hufflepuff, you’ll be guaranteed a feast. Why not pair with the Wrebbit 3D Hogwarts Astronomy Tower (£39.99) to capture the magic of the infamous institution as a whole, whilst gazing at the stars? Bring your own snowy owl home with this beautiful Harry Potter Magical Creatures Hedwig Figurine (£26.99). Perfect for desks or surfaces, your very own Hedwig will sit proudly wherever she is displayed – without having to feed her any mice! And of course, don’t forget your wand! 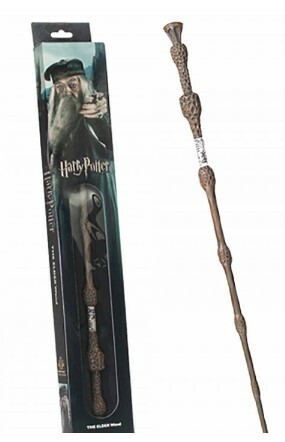 The perfect gift for any avid Harry Potter, Hermione or Dumbledore fan. These hand finished wands, (£24.99), made from cold pressed porcelain with a steel core for added strength, are the ultimate collector's item. Stay organised with the Harry Potter Wall Calendar 2019 (£8.99). Featuring all of your most loved characters, you’ll be able to keep track of spells, dates and crucial reminders such as ‘re-pot the Mandrakes’! Who needs a trip to Hogsmeade when you can make the perfect concoction at home with this stunning Harry Potter Hogwarts Mug (£9.99)? Whether you prefer Butterbeer, Pumpkin juice or Gillywater, it will taste all the better with this goblet-shaped vessel. Sort your family and friends into their respective houses this Christmas with the Wizarding World Interactive Sorting Hat Keyring (£6.99). Simply place on somebody’s head or palm of hand and let the Sorting Hat do its job! 10 points to Gryffindor! For an enchanted version of the classic game, the Harry Potter Cluedo (£24.99) will have the whole family on the edge on their broomsticks. Collect clues and solve the mystery of who dunnit. You never know, just this once it might not be down to, He Who Must Not Be Named! Test your knowledge with the Harry Potter Trivial Pursuit set (£9.99). For up to eight players, it’s ideal for showing off your Potter prowess and discovering who is the real witch or wizard of the family. 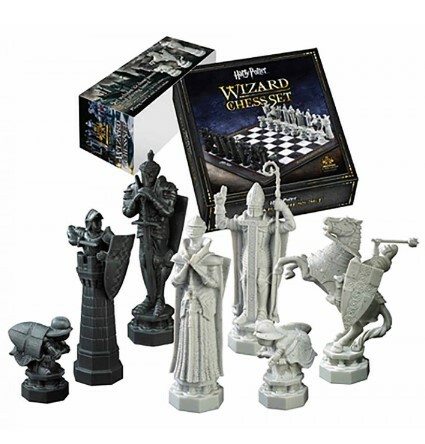 Whether a wizard or a muggle, chess fans young and old will love this Harry Potter Wizard Chess Set (£59.99). Recreate the iconic chess battle that Harry, Ron and Hermione played in their first year and bring the magic to life with an opponent of your choice. Always wanted to play as a Seeker but never quite got to grips with controlling your broom? 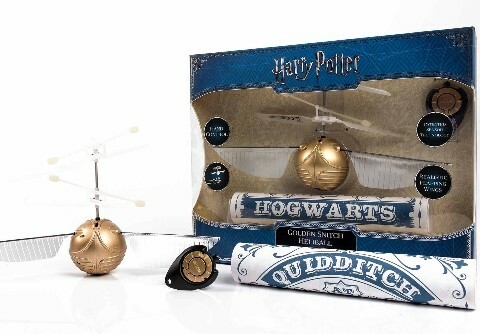 Why not try this Wizarding World Golden Snitch Heliball (£29.99) which will allow you hours of endless play time without the need for broomsticks? Using sensor technology, the golden snitch will hover in the air for you to chase but will fly away once you move to catch it. And when not in use, display your snitch on its plinth. Who says you can’t compete in the Quidditch World Cup? For the Newt Scamander of the family, give them a gift they will treasure forever. Create an aura of enchantment with this charming Fantastic Beasts 1000 Piece Puzzle (£12.99) (available instore) and let their passion for exotic beasts and creatures run wild. Finally, check out Harry Potter Magical Place and Characters Colouring Book (£9.99). Create your own version of Harry and his friends’ magical world with this delightful colouring book, with stunning illustrations for you to design however you wish. Featuring your favourite characters and scenes from the books and films, all that’s left to do is to bring them to life with your own enchanted designs. Lumos! This press release was distributed by ResponseSource Press Release Wire on behalf of Ryman Stationery in the following categories: Children & Teenagers, Men's Interest, Entertainment & Arts, Leisure & Hobbies, Home & Garden, Women's Interest & Beauty, Sport, Consumer Technology, Food & Drink, Media & Marketing, Retail & Fashion, for more information visit https://pressreleasewire.responsesource.com/about.